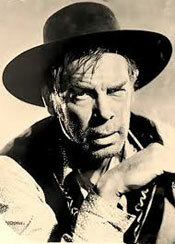 Rugged, rough-hewn and prematurely gray-haired, Lee Marvin was 27 years old when he made his first movie, “You’re In the Navy Now” (‘51 20th Century Fox) and 40 when he first starred in a film, “The Killers” (‘64 Universal). 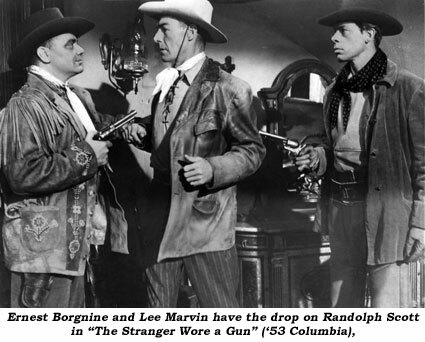 Previously, Marvin had starred on TV’s “M-Squad” for 117 episodes from ‘57-‘60. From there, a succession of hit films (“Dirty Dozen”, “Monte Walsh”, “Professionals”, etc.) kept Marvin at the top of the boxoffice, but an equal succession of failures in the ‘70s diminished Marvin’s status. 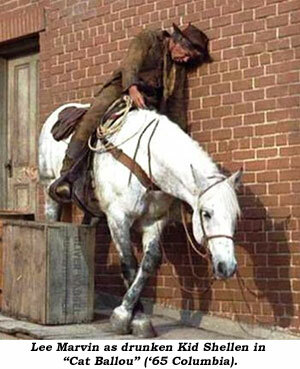 But on his way to stardom, his vicious demeanor was expertly exploited in a host of badman roles in Westerns. Born February 19, 1924, in New York City to advertising exec Lamont Marvin and his wife Courtenay, a fashion writer, the young Marvin was thrown out of dozens of schools for incorrigibility. His parents took him to Florida where he attended St. Leo’s Preparatory School near Dade City but he was dismissed there as well. Marvin enlisted in the Marines at the beginning of WWII. Severely wounded at Iwo Jima, he earned the Navy Cross. Pvt. Marvin was invalided with a severed sciatic nerve and discharged. Finding work in Woodstock, New York, as a plumber’s apprentice, he was asked to replace an ailing actor in a rehearsal while he was repairing a toilet at a local community theatre. Caught up with the acting bug, he went to New York City where he studied and found small roles in stock and off-Broadway. He made his Broadway debut in “Billy Budd” in 1951. 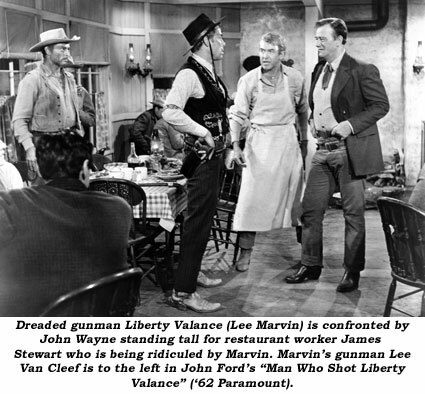 Quickly moving to Hollywood, he found work on TV in “Dragnet”, “Biff Baker, U.S.A.” and in films, including his first western, “Duel at Silver Creek” (‘52) with Audie Murphy. 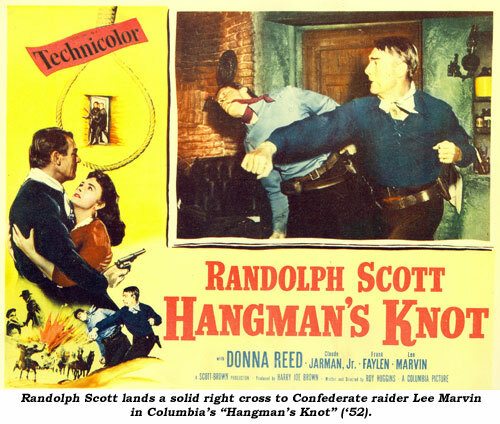 His talent was also seen in “Hangman’s Knot” (‘52), “Stranger Wore a Gun” (‘53), “Seven Men From Now” (‘56), “Man Who Shot Liberty Valance” (‘62) and many TV Westerns. Marvin was first married to Betty Ebeling in February 1951. They had four children, Christopher born 1952, Courtenay born 1954, Cynthia born 1956 and Claudia born 1958. The couple divorced in 1967. In 1979 he was dragged into court by his “companion” Michele Triola in the now infamous “palimony” suit in which Triola claimed half of Marvin’s income as her own. Marvin remarried in October 1970 to Pamela Feeley. It lasted until his death from a heart attack on August 29, 1987 in Tucson, Arizona. He is buried at Arlington National Cemetery in a grave alongside three and four star generals.